Hey, hey! 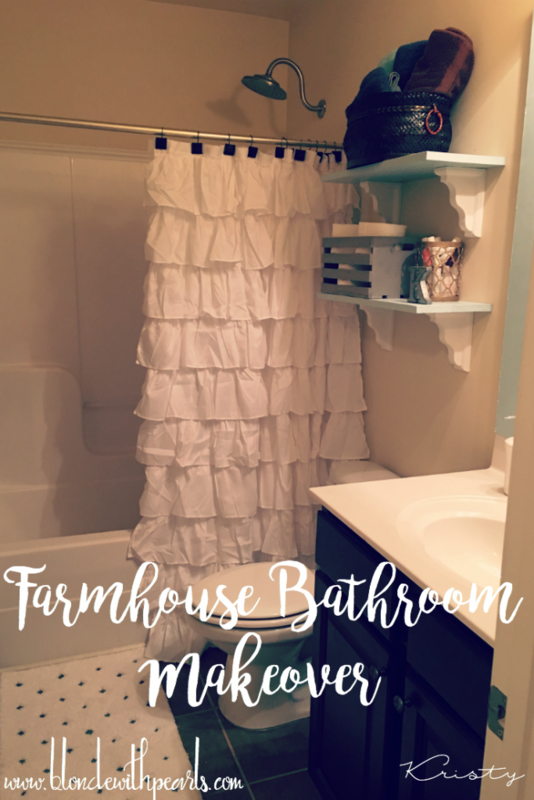 Today I have more on my quest to redecorate my entire house with farmhouse inspiration. 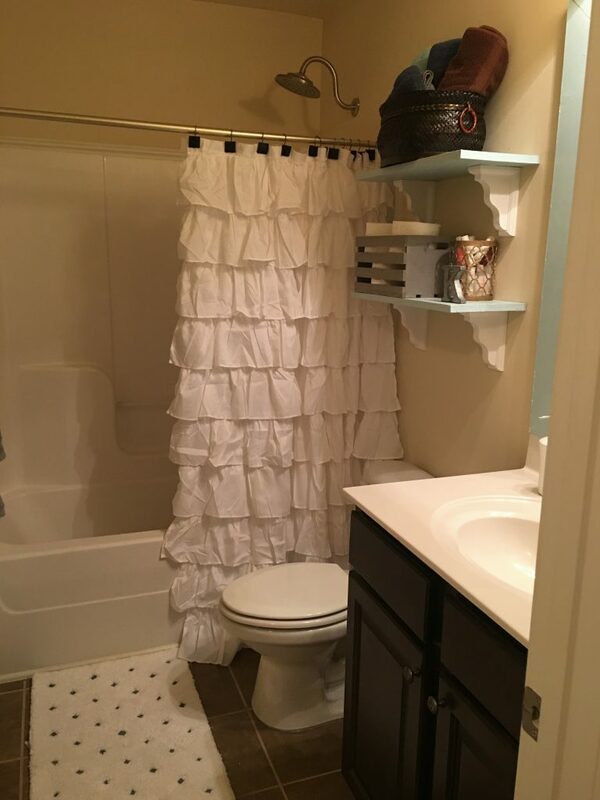 I recently gave my guest bathroom a makeover! The poor guest bathroom was kind of neglected thus far. It never really had its own décor or style prior to this. I’m extremely happy with the way that it turned out though! I wanted to dress up the standard, big, square mirror with a frame. Luckily, I had some extra wood that was used during the entryway project. I wanted to add shelving too since the vanity is fairly small. I used the extra wood for these too. 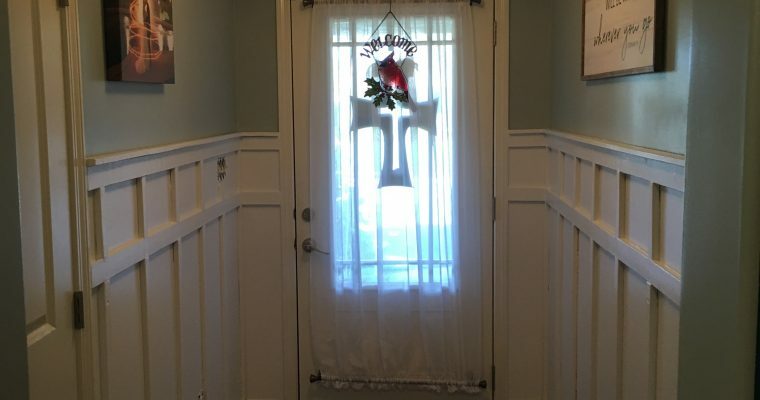 I was limited in what color I could use for these because I had already primed with wood for use in the entryway. 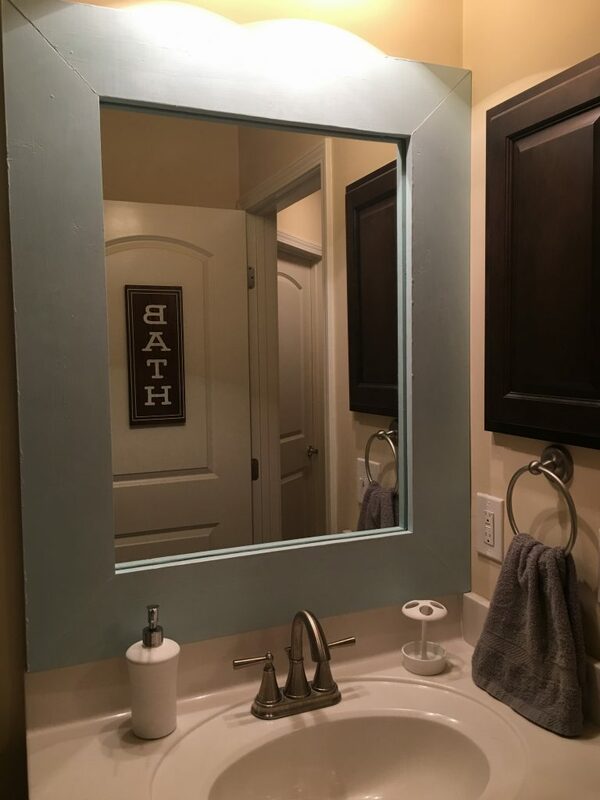 I decided I wanted to make it a light color though because the vanity and floors were dark. Since it’s a small bathroom I didn’t want to make it feel cramped with another dark element. I already had some chalk paint in the color “Provence” from Annie Sloan. I had read about how you could mix the colors, so I decided I’d just use this color and lighten it up. I bought some “Pure White” from a local arts/home décor store where they gave me more tips on mixing the paint. I used 4 parts white and 1 part blue to get the color I wanted. 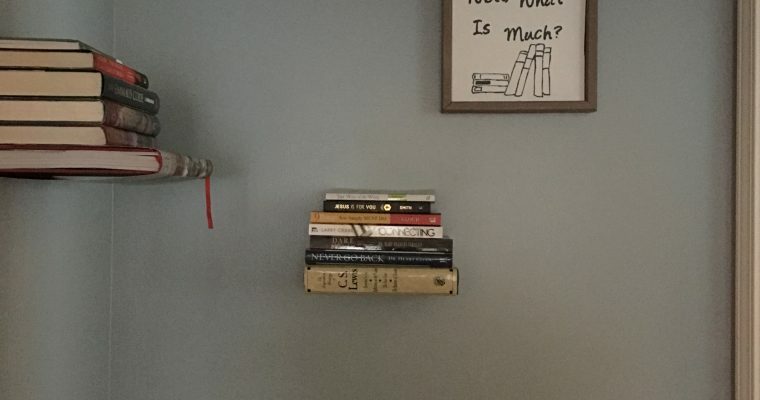 I used the light blue color on the frame and the shelves. I used just white on the corbels for the shelves. I painted these and let them dry in my living room. 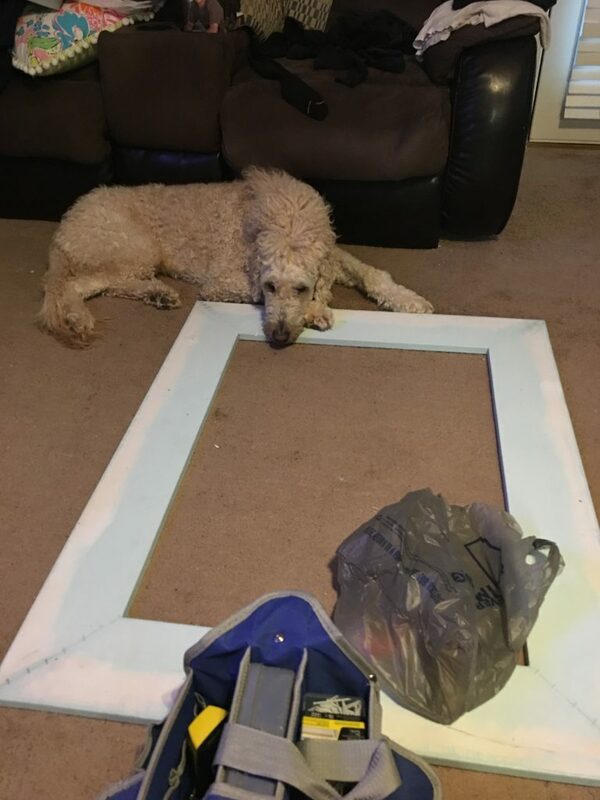 Kingsley decided that the frame was somehow his. 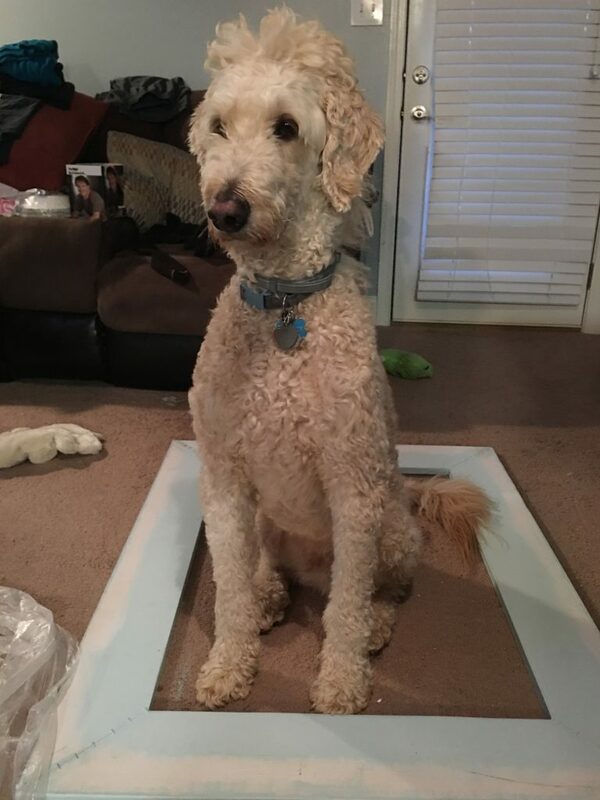 I would often find him sitting or standing inside of it and laying with his head or paws on it! Haha! I went about finding the rest of the elements for my new farmhouse bathroom. I scoured Target, Hobby Lobby, and Amazon to find the perfect items! My sister laughed at me so much during this time because I’m pretty sure I went to Hobby Lobby like 7 times over a week and a half! It was so worth it though! I got the basket and shower curtain from Amazon, floor mat from Target, and the rest of the things from Hobby Lobby. 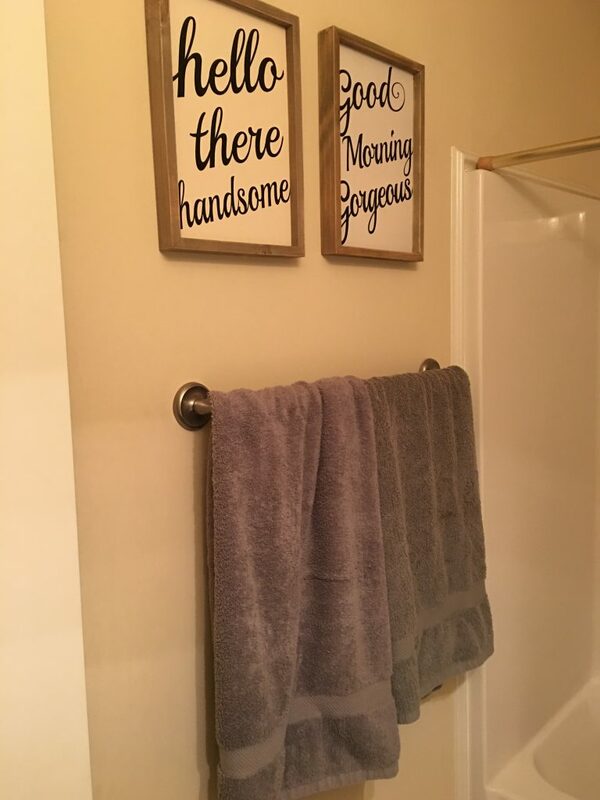 These two adorable signs were great finds from Hobby Lobby! We hung the frame with command strips! I used a ridiculous amount, like 16 I think? That sucker is not coming down on its own!! However, should I ever want to change the color, I totally can because we used command strips! The sign on the door is from Hobby Lobby, and the soap dispenser and toothbrush holder I already had. I think the most expensive thing was the basket from Amazon. I went to Hobby Lobby so often because you can get really great deals when you watch their sales. I don’t think I paid full price for anything from Hobby Lobby between their sales and using the 40% off one item coupon. I totally love the way this turned out. I had so much fun imagining how it should look in my head and seeing it come to life! Have you taken on any home design projects? Where is your favorite place to get home décor? I love that floor mat and the whole room is really beautiful! How exciting! Great job!